A contest to choose the best to save the race. The planet Haven appeared like a sparkling, incandescent jewel against the backdrop of space. It presented new hope for those who had travelled so far. Beauty though was deceptive. It was soon evident, that the danger was as great as the beauty. Over the next ten generations, the population numbers declined dramatically; a deadly attrition by flora, fauna and a disease that appeared to be endemic to the female population. Three quarters of the women died, before a vaccine was discovered. What originally had started as an evenly balanced community now had the men outnumbering the women by a factor of one hundred. This led to the genesis of a matriarchal based society where women were revered and became the leaders and planners; men took up the position of defenders and builders. The colony survived and grew. Every two years, all males between the ages of sixteen and twenty-one, were recalled to Hub City to participate in “The Summoning". The competition involved many facets; intelligence, creativity, strength, endurance and mastery of weapons. It had been initiated to select the best one hundred males to strengthen the gene pool of Haven. The winners would impregnate as many of the ruling class of women who were fertile at that time. They would then become part of the Elite Guard; the security force within the city. All female children from this union would remain within the city. All male children would be sent out to the sector towns on attaining the age of five. There they would be taught the use of weapons and how to survive against the many dangers associated with this world. It had been a long month for Jonas Hart. He had passed all the intelligence tests, tactical games, art and creativity challenges, weightlifting, archery and just the previous day, the long and grueling race around the city walls. Jonas struggled to open his eyes and force his weary body to move and obey his wishes. ‘This is the final day’, he thought to himself. Five thousand men had been selected; only two hundred remained. He had proved his right to be there. Only the one contest remained. Rising from his bed, he caught his reflection in the mirror. Tall for his age, at just over two meters, his muscles played smoothly beneath his pale skin. Tying his long dark hair into a ponytail, two piercing green eyes looked back at him over a crooked, beaked nose and wry smile. Completing his ablutions, he donned loose-fitting pantaloons and a reinforced metal fiber jacket with a number 75 prominent on its right sleeve. Pulling on soft knee length leather boots, he proceeded to a solitary breakfast. Each of the ten dining halls were capable of holding five hundred men. Jonas was the last person remaining in his. Although not hungry, he forced down some fruit. The sound of a gong reverberated through the large empty room. His mouth instantly felt dry. It was the final “Summoning”. Moving through the dimly lit tunnel, he was joined by others materializing from the gloom. They continued until a force of two hundred individuals marched with almost military precision towards the entrance of the arena. Emerging into the welcoming light of day, the smells and sounds of the assembled female populace lent a carnival like atmosphere to the proceedings. This contrasted with the seriousness which eminated from the men around him. Craning his head from side to side, he tried to catch a glimpse of his opponent. There! At the far end of the row of men off to his left, he spied a giant of a man standing apart from the others also wearing the number 75. He appeared indifferent to those around him and stared straight ahead. Weathered dark skin, muscles which were large and well defined; a mop of thick dark hair streaked with grey perched like a living animal upon his head. Sensing his scrutiny, the big man swung his head and looked at Jonas with pale blue eyes, devoid of expression. Through Jonas’ mind ran the advice of one of the elders from his home sector. ‘To be brave and courageous, one must first feel fear’. Jonas felt very afraid. His sweaty palms and the cold chills running through his body were testament to that. The two hundred were now matched with their opponents and then sorted into four groups. They were then sent to the tunnels to await their turn. Jonas breathed a sigh of relief. He would not be the first to compete, but more importantly he wouldn’t be the last. All men were expected to have mastery over a variety of weapons. A single weapon would be chosen on the final day with which they would all show their ability. The previous “Summoning”, the weapon of choice had been sabers. Whispers followed by groans went through the men assembled around him. They had been notified of what weapon was to be used. Quarter staffs! A two point four meter long piece of iron wood, four centimeters thick; shod at each end with a metal cap. It was a flexible weapon, capable of both defense and attack; a weapon where broken bones were common and death a possibility. Jonas allowed himself a small grin. This was one weapon that he was proficient in. The face of his opponent still remained blank, showing little concern at the choice. Jonas tried to center himself; to concentrate and prepare for his match, but he found it difficult. The ear splitting roar of the crowd and the cries of pain, as warriors were helped or carried from the arena, shattered his concentration. He felt sickened by the parade of broken limbs and expressions of intensive pain on the faces of the returning contestants that passed by him. Three warriors had been stretchered off, faces shrouded. It was unknown if they were alive or dead. Finally, his number was announced. Tightly grasping the quarter staff which had been supplied, he moved towards the light. 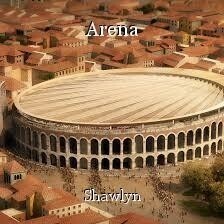 The heat of the day had risen, as had the sound and smell of the humanity surrounding the arena. Looking up, he spied the frenzied faces of the thousands of women as they screamed and cheered for the next event. They had not yet been satiated of their blood lust. He and his opponent moved to the center and faced each other. Jonas stuck out his hand and said his name. The other looked down surprised and nodded. He did not take up the offer, but did say in a low, soft voice; ’Kai’. Both moved back and took an ‘on guard’ stance. Setting feet apart, Jonas held the staff with his left hand near the end and his right, quarter of the way up. Kai did not hesitate. Surprising Jonas with his speed, he moved forward with a powerful downward strike, hoping to catch him off balance and end the match quickly. Moving swiftly, Jonas repositioned his hands equidistant from the ends and managed to catch the blow above his head. It almost ended there. The raw power of the stroke drove him to his knees. Kai followed up with two more hammer like strikes which he only just managed to contain. Moving his hands down and grasping the end, Jonas swung the staff like a cudgel at the knees of the other who leaped high and managed to avoid it. Changing tactics, Kai moved backwards and returned to the ready position. Jonas rolled to his feet and copied the stance. Now he had a better understanding of what he faced. Kai moved forward once more, duplicating his previous attack and once more relying upon his speed and strength. Jonas did not try to catch it this time, but rather turned his body aside and deflected the blow downward. Keeping up the momentum of his turn, he brought the staff spinning round and connected with Kai's back, forcing him to stumble forward. Recovering quickly, Kai advanced once more and swung mightily at Jonas’ legs. Jonas placed the staff end firmly on the ground and jarringly halted his opponents’ forward momentum. Swinging his own staff upward along with Kai's own, he stepped forward and swung the reverse end into his opponent’s stomach. It was like hitting a block of stone. Quickly he stepped back from Kai. Though they had only a small number of exchanges, both were breathing heavily. The speed and intensity that they had employed left the adrenalin surging through their bodies. Over the next ten minutes, many blows and parries were traded. A series of thrusts, sweeps and blocks to the areas of the body which would bring an end to the bout; knees, eyes, hands, feet, groin and throat. Both of them had sustained some damage; even Kai. Both were tiring. Jonas knew that he had to bring this to an end and quickly. He had very little in the way of reserves with which to continue. The only way to end it was to risk all and do the unexpected. Clasping the staff at its center, he began to rotate the staff in a vertical plane in a figure of eight; pushing ever more energy and ever more speed into the rotations. Kai stopped and paused. He had never seen this style of fighting. Jonas pushed his staff until it was a blur and the air vibrated with a sound like a buzz saw. Kai approached and tried to thrust through the whirling defense that had been erected. Each time his staff was deflected. Jonas judged that the moment was right. It was all or nothing. He changed the angular momentum of his staff and brought it sharply down upon the other with an unstoppable force. The vibration between the two hard wood weapons forced Kai's staff aside leaving him open to attack. Jonas took advantage of this and used the rebound to strike upward into the temple of his opponent. Both stood frozen. Jonas planted his staff and clung to it like a lifeline as he struggled to stay up right. Kai stood motionless, like a statue. His staff fell by his feet. Eyes glazed and with a look of total disbelief upon his face, he fell like a tall tree which had been cut down. Still and unmoving, he lay sprawled on the ground. The fevered screams of the crowd echoed around Jonas. The painted faces and mouths of those watching were drawn into grotesque caricatures. Members of the Elite Guard moved forward to clear the arena for the next bout. One grabbed Jonas's arm and supported him, as he shuffled forward towards the exit. Four other guards carefully rolled Kai on to a stretcher. With an effort, they raised him and also moved into the tunnel. A new pair emerged; ready to do battle for the amusement and honor of those present. Jonas sat with his head buried in his hands; exhausted beyond belief. Beside him lay Kai, who was just starting to stir. Jonas had achieved what he had set out to do. He was now a member of the Elite Guard who served the ruling classes. This position was the highest aspiration of all men on the planet. He now realized that he did not want it. The background was well-constructed, and the battle description excellent. The best part of all were those last few sentences -- fighting for something you can no longer stand. Thanks for checking in. Your comments are always appreciated.